Opportunity to learn about Western Port’s Marine Parks and Volunteering. Parks Vic’s annual voyage to Western Port Marine Parks encouraging Community Monitoring. Get to know and learn how to protect your amazing watershed. 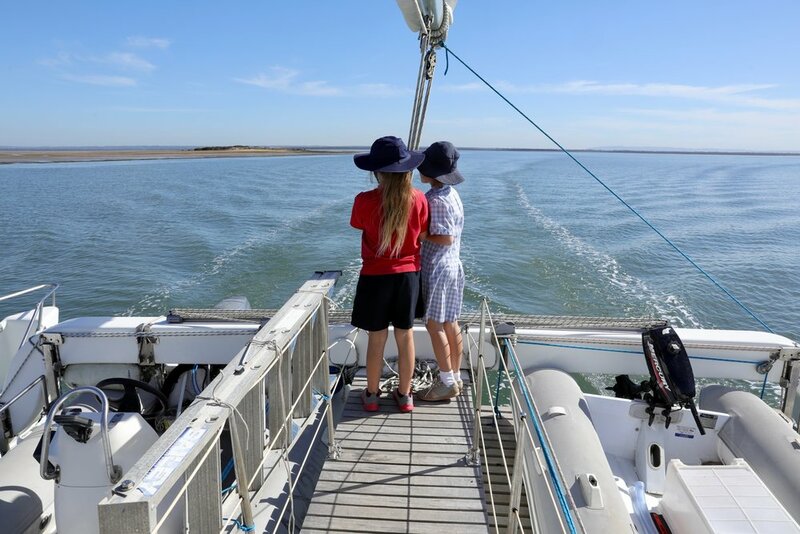 ‘Parks Victoria is delighted to invite you to join us aboard the SV Pelican to participate in a variety of community monitoring activities within one of Western Port’s Marine National Parks. School kids looking out over Western Port during Two Bays 2018. Port Phillip and Western Port Bays support a range of highly important ecosystems and habitats, a diverse and range of animals and plants, and provide many environmental, social and economic benefits to Victorians. The bays are an important part of the cultural heritage for the Kulin First Nation people and continue to be the focus for a wide range of cultural activities and endeavours. The health of our two bays depends partly on the way in which we use and manage our catchments. Particularly in relation to water quality. We also know there are many risks to the marine environment posed by climate change. Globally, it is the ocean that is doing the heavy lifting in terms of absorbing much of the carbon released into the atmosphere. Two Bays provides a unique opportunity for bay managers, stakeholders and educators to build knowledge, engage coastal communities, form partnerships to better understand and protect bay values, and to highlight the our links with bay health. The program is designed to develop deeper cross-collaboration and knowledge sharing. The program has created a unique curriculum based on the science and traditional knowledge of both bays. We are working with Bay schools, delivering marine-focussed curriculum and experiential learning opportunities. This year we are planning to focus on marine pests (unfortunately a perennial focus), marine education, acoustic ecology, and engaging coastal communities with opportunities to get out on the Bays as citizen scientists. WHAT: The Two Bays project utilises Pelican 1, a 62 foot catamaran, to conduct marine research, community engagement activities, and provide opportunities for dialogue and information sharing on key bay environmental themes. The Two Bays project seeks to build on the outcomes achieved in previous programs. 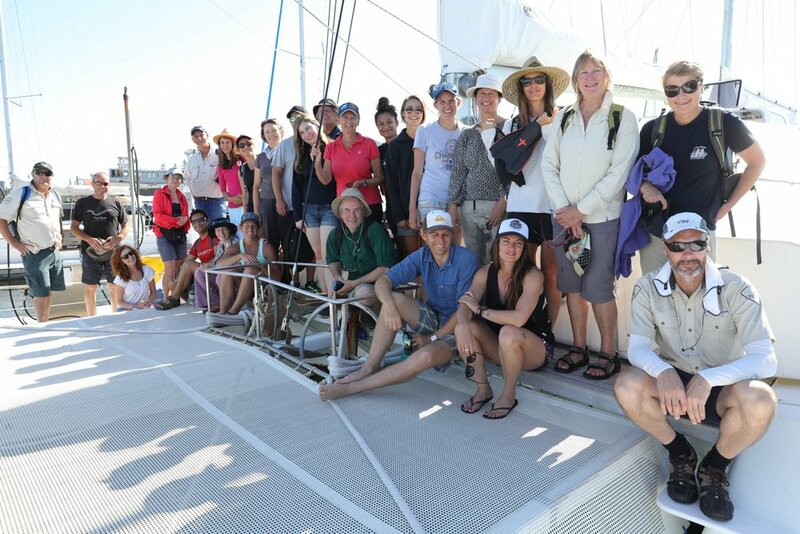 A marine science education program, involving a citizen science focus investigating the bays rich and diverse marine habitats, marine protected areas, climate change, water quality and bay health. ‘Learning at Sea’ programs. Ocean Dialogues- opportunities for bay managers to learn and share knowledge about the health of the Bays and ways to protect them. WHERE: This project will occur in Port Phillip and Western Port Bays, and along the linking coast. Destinations planned include Beaumaris, St Kilda, Williamstown, Mt Martha, Queenscliff, Hastings, French Island, Mud Islands, Geelong and Corner Inlet, Gippsland.. Smooth Toadie in the underwater garden at Rickett's Point Marine Sanctuary on the Kingston Koorie Mob day. Two Bays provides a unique opportunity for bay managers and stakeholders to build knowledge, engage coastal communities, form partnerships to better understand and protect bay values, and to highlight the our links with bay health. The program is designed to develop deeper cross-collaboration and knowledge sharing. The program has created a unique Ocean Literacy curriculum based on the science and traditional knowledge of both bays. What will we find in our blue backyard over Two Bays 2018? Discovering a Blue-ringed octopus in our blue backyard from Saltwater Projects on Vimeo. Parks Victoria is delighted to invite you to join us aboard the SV Pelican 1 to participate in a variety of community monitoring activities at Mud Islands, Port Phillip Heads Marine National Park as a part of the Two Bays 2018 program. Are you Ocean Literate? Harry Breidahl teaching the basic Ocean Literacy principles to Grade 6 Primary School students from Melbourne's West. Pelican taking off from Mud Islands. Mud Islands is a very important Pelican nursery. Ever wondered why you never see those amazing fluffy Pelican chicks? They are all here. The Two Bays program is subject to changes and additions. First day of the program. Pictured the welcome for the Kingston Koorie Mob by Arweet Carolyn Briggs and safety brief by the Skipper Garry McKechnie. 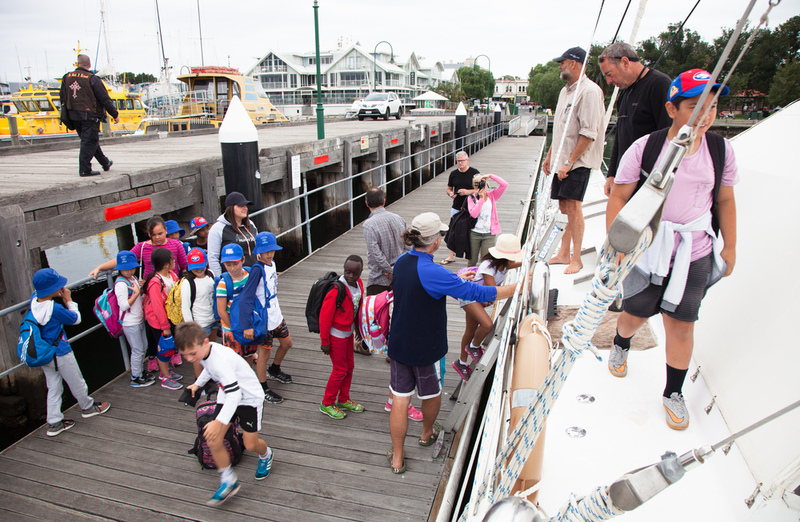 Year 4 students from Mother of God Primary step aboard Pelican1 for the marine education experience of a lifetime. Pelican1 will set sail from her home port of Bermagui on January the 22nd to make her way south to Melbourne for the 2016 Two Bays program. This trip can take between 2-5 days. 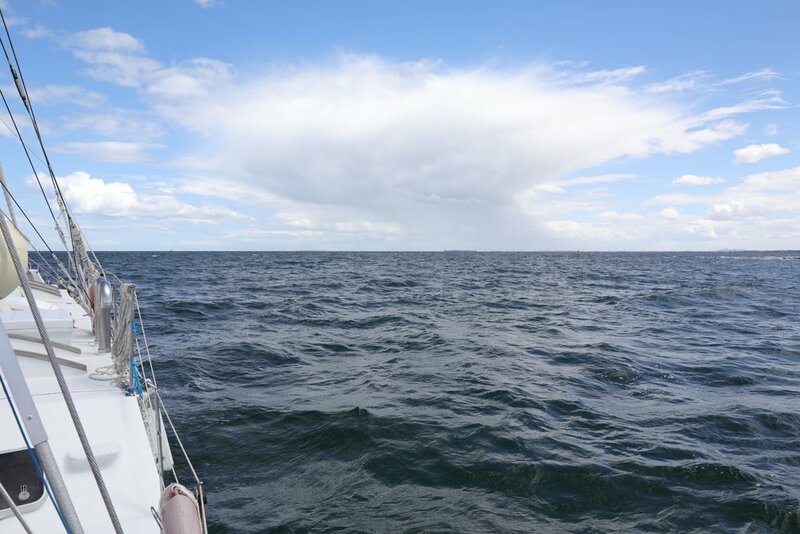 The team has to be quite flexible to accomodate weather and most comfortable sailing conditions. There is an opportunity to sail down with her for $150 a day with a maximum charge of $500 for the whole trip. The cost covers catering and accommodation. If you are interested please contact the Skipper - Garry McKechnie on 0425727553. There is a daily bus service to Bermagui from Melbourne. Sailing on Pelican1 with the Boonwurrung Foundation and the Port Phillip and Western Port Catchment Management Agency during Two Bays. Short films about Connecting to Sea Country- made with support from Youthworx and VACCA (Victorian Aboriginal Childcare Agency). The day with the Kingston Koori Mob is supported by the Kingston City Council. The Two Bays Project on S.V. Pelican1 involves conducting marine research, marine education programs, community engagement activities, and provides opportunities for dialogue and knowledge sharing on key environmental themes that are relevant to Port Phillip and Western Port Bay in Victoria. The Two Bays project has been successfully completed over the last nine summers and seeks to build on the outcomes achieved in these programs. an Indigenous program building links between traditional ecological knowledge and Western science. To provide an opportunity for volunteer marine focused community groups in both Port Phillip and Western Port to develop and enhance skills in scientific monitoring in selected Monitoring sites. Gain Indigenous perspectives of the Two Bays through shared dialogue and storytelling with Indigenous Elders and rangers. Better understand water quality impacts on bay health and future plans to improve water quality. Hear the Two Bays Story – an ongoing story created during the journey of the Pelican 1 through the different environments threading Indigenous stories as an essential part of connecting with Sea Country. Celebrate bay environments and iconic bay species such as the Weedy seadragon, seagrass, seabirds, mangroves and dolphins. Focus community attention on the important and unique natural and cultural values of the bays including Indigenous values and Marine National Parks and Sanctuaries. Connections to schools in both bays and working with the Two Bays curriculum and the principles of Ocean Literacy. Citizen Science Day in Western Port- learning how to monitor seagrass. Aunty Carolyn Briggs on board Pelican1. Aunty has been part of the development of the program since the second year of Two Bays.